HPC-09 will help cutting costs in several areas in the Curing Phase of the Concrete Element Production Line. Through our Concrete Plant Optimization Services or our Test Installation Service, we can help you find areas to optimize at your plant, and thus improve on production economy. There are two main phases in the Concrete Element Production Line: Mixing and Curing of the concrete. Most plants employ advanced equipment in the mixing phase. However for the important Curing phase, relatively old and crude equipment is often employed: Compressive Strength tests on cylinders / cubes are time consuming, and the Concrete Test Hammer (Schmidthammer) is unreliable to en extent where some plants has prohibited its use. In the article "To cure or not to cure" Evan Gurley writes about how precasters use a lot of energy to create the perfect mix, while the very important curing phase does not receive the attention needed. Quote: "Precasters pay so much attention to ensuring raw ingredients meet quality standards, calculating the best mix design and training personnel exhaustively on how to batch, place and consolidate. While these are all essential steps in manufacturing quality concrete, it is all in vain without proper curing." Maturity meters will help you calculate when the concrete has reached its target strength. However, maturity meters will not help with Planning, Control, Wireless Real-time Monitoring and detailed Documentation of all the phases of the Placing and Curing Process! 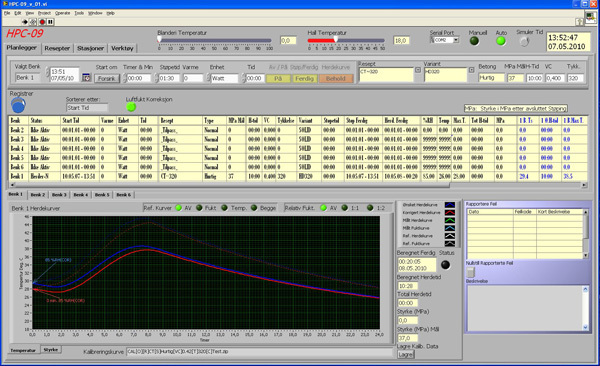 There are several programs on the market for calculating Temperature and Compressive Strength development. However, none of these programs are designed to integrate seamlessly with the Curing Phase of the Concrete Element Production Line like HPC-09 does! These programs are best suited for larger projects and does not integrate well with a production line. HPC-09 is a modern, well tested tool that integrates seamlessly with the curing phase of the production line. It takes only 15 seconds to enter data for each bed in the Program shown in figure 1 below! 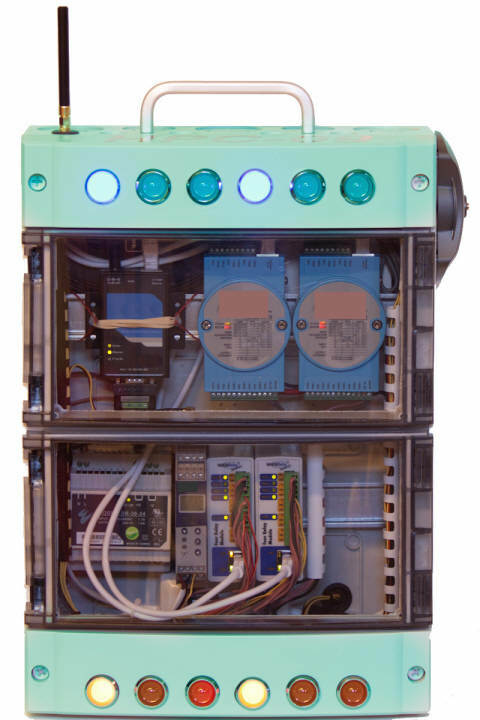 From that point of, the system is controlled wirelessly from the Measurement Stations (figure 2) and sends data wirelessly to the Control Panel (figure 3). The Control Panel is installed in the production environment and signals the workers when the target strength is reached! Wireless technology makes for minimum installation costs! 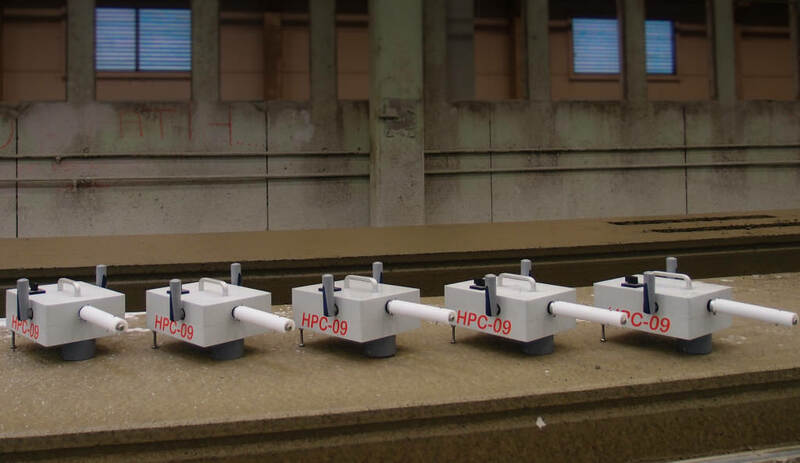 Figure 2: HPC-09 Wireless Measurement Stations. HPC-09 calculates the concrete temperature and bed heating (if used) needed to meet target strength in target time. Gone are the days when excessive heating must be used just to be on the safe side; this makes for large savings! Using theHPC-09Planning Module, you can calculate the Curing Time before production commences. This makes the production predictable, and enables you to exploit the production capacity to its maximum! HPC-09 wirelessly signals the workers via the Control Panel when the concrete has reached target strength. 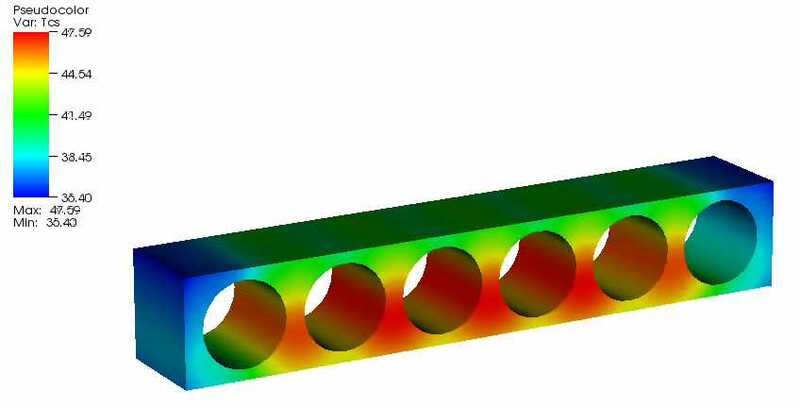 HPC-09 calculates Compressive Strength. To achieve maximum accuracy, calculations are based on Local Calibration Data, the plants Local Concrete Mix Designs and Local Production Parameters. Calculations typically stays within 0.1 - 2 MPa of measured Compressive Strength on cylinders / cubes. Using HPC-09 , you can continuously Monitor Temperature- and Compressive Strength Graphs and thereby detect production anomalies at an early stage. HPC-09 has repeatedly detected anomalies such as: Varying aggregate quality, problems with mixer dosing units, worn bedcovers, unusual draft in the production environment or other causes that may be hard to spot without using HPC-09. Without the predictability introduced by HPC-09 , rapid cement is often used in cold regions to be on the "safe side" of the curing target time. Production of rapid cement has a large carbon footprint, and its use is subject to being taxed. HPC-09 introduces a level of predictability in the production that may make it feasible to use low carbon cement and still meet the target curing time. This makes for even more savings! The level of required documentation is increasing year by year. Your customers will also require more documentation on purchased products. Today, documentation is mainly provided by the Concrete Mixer stations; however, they can only document what went into the concrete mix! Often very little documentation is provided from the very important Curing Phase! HPC-09 provides you and your customers with this vital documentation! Objective Technology believes that customers will prefer suppliers that can provide this level of documentation!